An author's reply to this comment is available at http://dx.doi.org/10.1007/s10198-015-0712-y. This comment refers to the article available at: http://dx.doi.org/10.1007/s10198-013-0554-4. The study by Mennini et al. 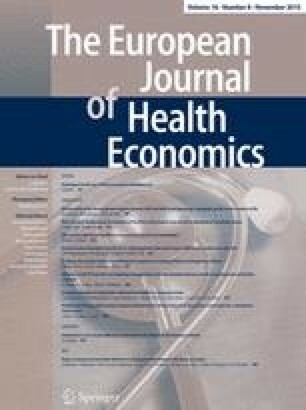 uses a decision model to assess cost implications of improving adherence to medication in hypertensive patients in five European countries (England, France, Germany, Italy, and Spain) from a payer’s perspective over 10 years. To this end, the model predicts the 10-year risk for cardiovascular events based on the Framingham risk equation. In terms of costs, it considers drug and hospitalization costs. The model suggests savings through avoiding cardiovascular events in each of the five countries. where absolute risk reduction (ARR) refers to cardiovascular events. With regard to the first equation, Table 1 provides data on the ARR of BP control. In Italy, for example, a favorable estimate for the ARR of BP control is 5.5 % (=10–4.5 %), which holds for females. In addition, based on data in Appendix C, 56.7 % of Italian patients treated are controlled. Hence, the ARR of BP treatment is 3.1 % (5.5 × 56.7 %). Inserting this value in the second equation yields the net cost: 10 × €280−0.031 × €3939 = €2677.16. Hence, BP treatment in Italy leads to a net increase in costs. We obtain the same result for the other countries. Therefore, from the reading it is not clear how the authors came up with their finding of savings from adherence improvement. This result is also at odds with the results of cost-effectiveness analyses on BP treatment conducted in England and Germany using the Framingham risk equation as well: they did not show savings except for the treatment of high-risk patients [2, 3].